Download Catalog #56 PDF: Click to download (requires Adobe Acrobat Reader). Printable in B&W or color! 1955 Conway Stewart 22 "Rose Floral" LF. GFT. The only CS with a "Greek Key" cap band. Very rare and extremely collectible. Lambrou claims in his book that there were only 200 made! Fine nib. New-old-stock. Mint. 1878 Cross, A.T. Stylograph eyedropper-fill in Red Mottled Hard Rubber. Very rare early Cross pen in outstanding condition! 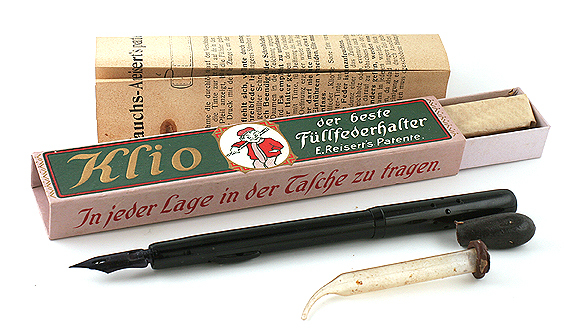 The front of the pen opens for filling; unscrew the back blind cap just slightly to reveal a vent hole which allows air to enter the barrel so the ink flow doesn’t cease due to vapor lock. New-old-stock. Mint. 1930 Omas Extra Large Faceted lever-fill in Green Pearl Swirl. Roller-ball clip. GFT. Fine, triple-flexible nib! New-old-stock. Mint in box. Close-up of pen in box. 1925 Montblanc 0 Safety eyedropper-fill in BHR. Extremely hard to find. Montblanc "14K 0" fine nib. Near mint. 1946 Montblanc 139 Meisterstuck PIF in Black. GFT, with outer cap bands in Sterling Silver. Short, visualated window (unlined). 14C three-toned, double-broad nib. Near mint. 1993 Montblanc Imperial Dragon Ball Pen on Black. Serial number 0584/1500. New-old-stock. Mint with label still on barrel (but the writing is worn off the label). Sterling silver trim. No box or papers. 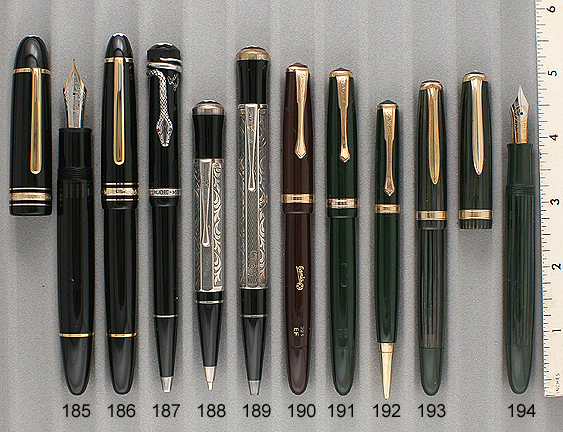 [See "Montblanc" section below for more LE ball pens]. 1927 Parker Duofold Sr. BF in Mandarin Yellow. GFT. Fine point. Near mint+. 1931 Pelikan T111 Toledo PIF in 24K gold-plated sleeve with etched pelikans surrounded by fine tooling. Black cap with etched clip and knurled cap bands. Double-broad nib (other nibs available). New-old-stock. Mint in original box (box worn – but at least it kept the pen perfectly mint! Close-up of pen in box. 1933 Pelikan 112 PIF in 14K solid gold. Alternating panels of pinstriping, smooth and wavy engine-turning. Green celluloid barrel window. No dents or dings. Medium nib (other nibs available). Near mint. 1937 Sheaffer Lifetime Sr. Balance LF Set in Roseglow! Perhaps Sheaffer’s rarest and most beautiful color. GFT. Two-toned, medium nib. Visualated section. New-old-stock. Mint in original box. Close-up of set in box. 1917 Waterman 42 “Continental Safety” eyedropper-fill in 18 K gold-filled on BHR. Outstanding design, with alternating spiral panels of white and yellow rolled gold filigree, separated by a double row of barley spiral. Repousse rose on crown. Medium, flexible nib. New-old-stock. Mint. 1920 Waterman 452 ½ LF in Smooth Sterling Silver Overlay on BHR with Blue Enamel Perpetual Calendar! Very early English overlay, with the barrel overlay fastened to the barrel by two machined small sterling silver pins. Wonderful perpetual calendar. Broad, extra-flexible nib. Near mint. 1927 Waterman “Hemisphere” LF Desk Set in Sterling Silver. Incredibly beautiful! Fine, flexible nib. Waterman UK hallmarks. No dents or dings. Would be magnificent on your desk or table. Near mint+. Close-up of desk set. 1929 Waterman Lady Patricia LF Set in Sterling Silver Overlay “Bay Leaf” pattern. One of the rarest of Waterman’s overlays, found only on the Lady Patricia and the model 494.Extra-fine nib. Pen has one small ding in the smooth silver just near the bottom of the barrel. The pencil has several minor dings. 1929 Waterman Lady Patricia LF in Sterling Silver Overlay “Cable Twist” pattern. 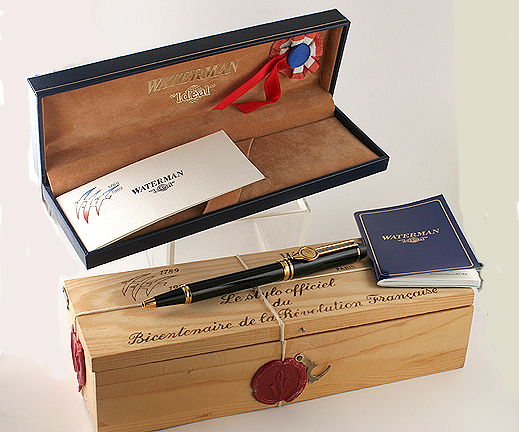 Perhaps the rarest and most beautiful of Waterman’s overlays, found only on the Lady Patricia. Fine, flexible nib. Near mint+. 1930 Waterman Patrician LF in Moss Agate. GFT. 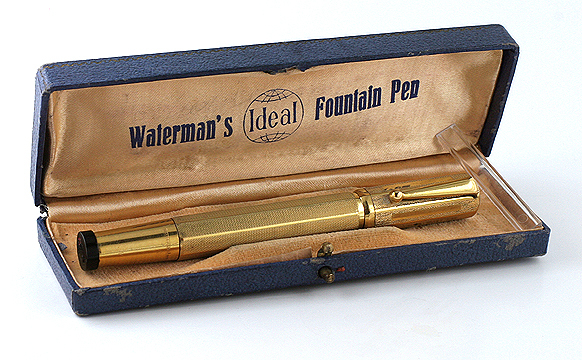 The Patrician was Waterman’s first entry into plastic pens. From 1924 through 1929, competitor’s captured much of Waterman’s market share, as Waterman was trying to earn back their investment in colored rubber (rose ripple; olive ripple; blue-green ripple). Unfortunately, the Patrician didn’t help much, as the depression was in full swing. 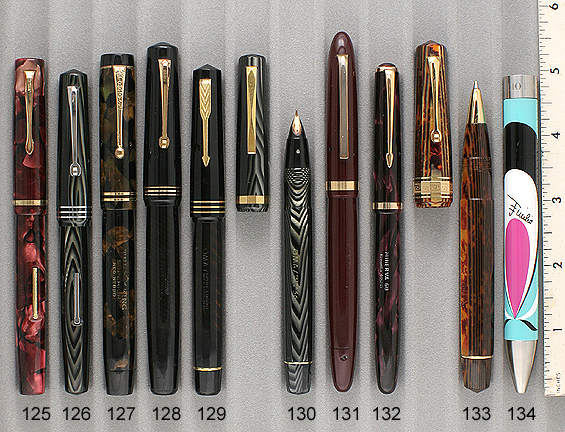 While Waterman held on, struggling for about another 25 years, they really never did recover and recapture their market share. Fine nib, with a tad of flex. New-old-stock. Mint. 1921 Sheaffer 3 “Self Filling” LF in Black Chased Hard Rubber. 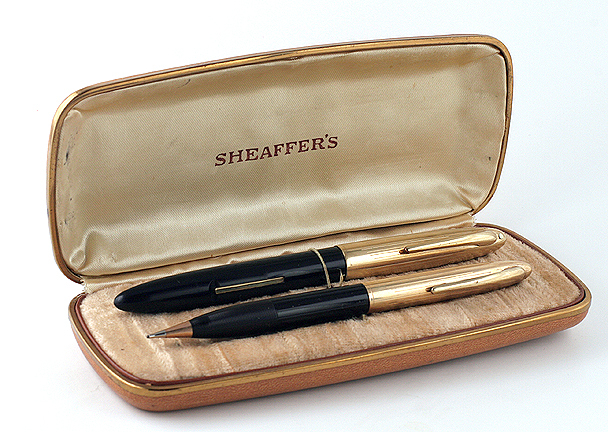 Early example of a Sheaffer. NP lever. Second party accommodation clip. Fine, flexible nib. Near mint. 1922 Sheaffer 46 Special “Loaner” LF in Black. These pens were loaned to store customers who left their pen for repair. Barrel imprinted "Service Pen Loaned by Turtle Lake Drug Company." GFT. Medium nib. A little shopworn, but very nice indeed. 1924 Sheaffer Lifetime Sr. Flat-top LF in Deep Jade. GFT. Fine nib. New-old-stock. Mint with original label on the bottom of the barrel (faded). 1924 Sheaffer Sr. Lifetime “Autograph” Flat-top LF in Jade. GFT. Medium nib. Discoloration of the cap and barrel make this a user grade pen (reflected in the price), but the wide 14K band and 14K clip go a long way in making up for it. Otherwise near mint. 1925 Sheaffer Demonstrator Flat-top Pencil in Black. The pencil barrel has two factory portholes through which you can see the mechanism moving when operating. GFT. Near mint. 1925 Sheaffer Lifetime Sr. Flat-top “Autograph” in Black. 14K solid gold cap band and clip. The original design was to have the owner’s signature engraved onto the cap band (this one is clear). Medium/fine nib. Near mint. 1929 Sheaffer Sr. Lifetime Oversize (extra-long) Balance LF in Black. GFT. Medium/fine nib. Near mint+ (could be new-old-stock). 1929 Sheaffer Sr. Balance Oversize (long) Pencil in Jade. GFT. New-old-stock. Mint. 1929 Sheaffer Lifetime Balance Convertible Pen & Desk Pen in Black & Pearl. End of barrel unscrews and can be replaced with a BHR taper. GFT. 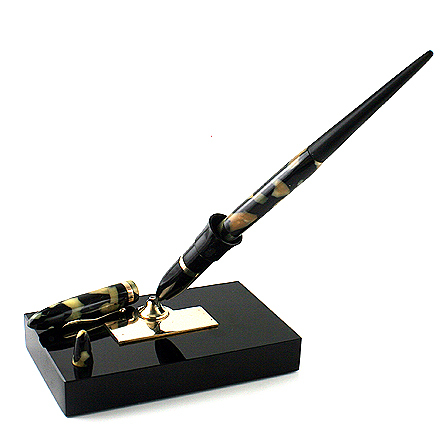 Pen can be carried as a pocket pen or used as a desk pen in the rectangular black glass desk base. Fine nib. A little barrel ambering. Otherwise near mint. Close-up of desk set. 1933 Sheaffer Sr. Lifetime Balance “Autograph” LF in Black. 14K band and clip. Two-toned, medium/fine nib. New-old-stock. Mint. 1932 Sheaffer 5-30 Balance LF ring-top in Green Marble. 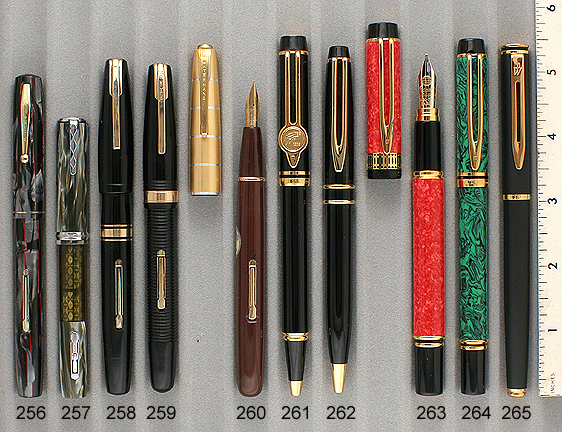 Sheaffer celluloid ring-top pens are surprisingly rare. GFT. Medium/fine nib. Near mint. 1933 Sheaffer Sr. Lifetime “Autograph” Balance LF in Green Marble. 14K trim. Medium nib. New-old-stock. Mint. 1933 Sheaffer Lifetime Balance full-length (thin) LF in Green Marble. GFT. Rare, medium, extra-flexible, italic nib! Near mint. 1933 Sheaffer Sr. Lifetime Balance LF in Red Veined Grey. GFT. Two-toned, upturned, medium/broad “Ball point” nib. Just a tad of clip ball brassing, otherwise near mint+. 1935 Sheaffer 3 Balance LF Thin in Red Striped. NPT. Medium nib. Visualated section. New-old-stock. Mint. 1936 Sheaffer “Junior” LF in Ebonized Pearl. NPT. Visualated section. New-old-stock. Medium nib. Mint. 1936 Sheaffer Lifetime Balance full-length (thin) LF in Green Marble. GFT. Rare, fine, flexible nib! New-old-stock. Mint. 1936 Sheaffer Lifetime Balance full-length (thin) LF in Black & Pearl. GFT. Rare, fine, flexible nib! New-old-stock. Mint. 1936 Sheaffer 3 Balance LF Thin in Golden Striped. GFT. Medium, italic nib. Visualated section. New-old-stock. Mint. 1936 Sheaffer 3 LF in Ebonized Pearl. GFT. Visualated section. Extra-fine nib. New-old-stock. Mint. 1936 Sheaffer Sr. Lifetime Balance LF in Green Marble. GFT. Two-toned, fine nib. New-old-stock. Mint. 1936 Sheaffer Lifetime Balance (thin) LF in Jade. Beautiful color! GFT. Extra-fine nib. New-old-stock. Mint. 1936 Sheaffer 275 “Junior” Balance LF in Red Striped. NPT. 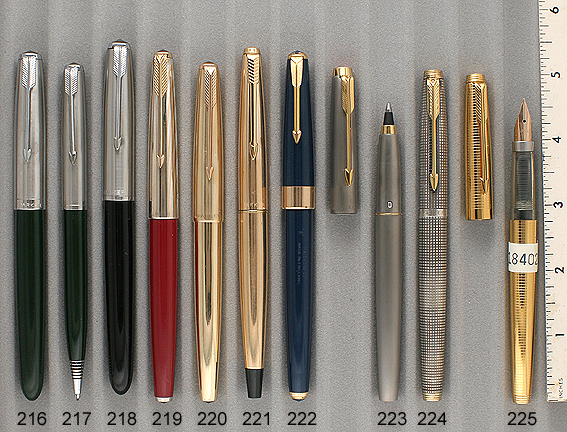 Clip and (fine) nib signed “Sheaffer Junior.” Visualated section. Near mint. 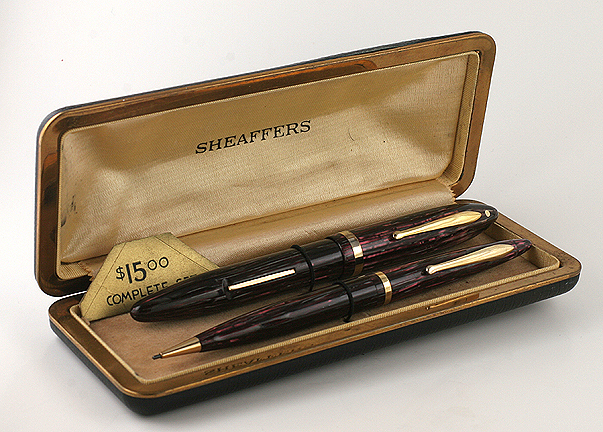 1936 Sheaffer Sr. Lifetime Balance LF in Ebonized Pearl. GFT. Two-toned, medium/broad nib. Near mint+. 1936 Sheaffer 5 “Feathertouch” LF in Ebonized Pearl. GFT. Visualated section. Fine nib. New-old-stock. Mint. 1937 Sheaffer 350 “33" Balance LF in Red Striped. GFT. Visualated section. Fine nib. Near mint. 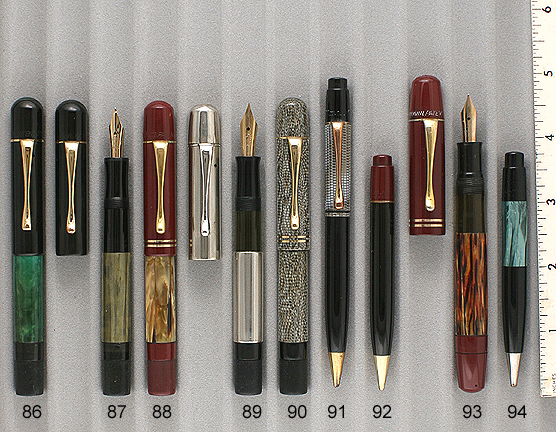 1937 Sheaffer 500 Feathertouch Balance LF in Red Striped. GFT. Visualated section. Two-toned, fine nib. A few scratches to the clip, otherwise near mint. 1937 Sheaffer 500 “Feathertouch” Balance LF in Grey Striped. NPT. Visualated section. Fine nib. New-old-stock. Mint. 1937 Sheaffer Sr. Lifetime Balance LF in Grey Striped. NPT. Two-toned, extra-fine nib. Visualated section. New-old-stock. Mint. 1937 Sheaffer Sr. Lifetime Balance LF in Black. GFT. Medium/fine nib. Near mint. 1937 Sheaffer Lifetime Balance 1st Year Crest LF in Golden Striped with pinstriped gold-filled cap. GFT. The rare, first year model has the cap threads at the very top of the gripping section. Two-toned, fine nib. Visualated section. This pen came in two sizes, this being the smaller (and rarer) of the two. New-old-stock. Some minor surface scratches noticeable with a loop, otherwise mint. 1937 Sheaffer Lifetime Balance LF in Grey Striped. NPT. Two-toned nib. Visualated section. Fine nib. A little brassing to the lever, otherwise near mint. 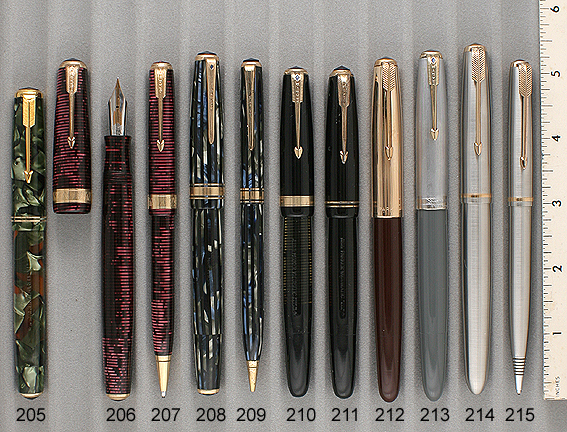 1937 Sheaffer 500 Feathertouch Balance LF in Golden Striped. GFT. Visualated section. Two-toned, medium/fine nib. Barrel imprinted “Thomas Healy.” Near mint. 1937 Sheaffer Sr. Lifetime Balance LF in Grey Striped. NPT. Two-toned broad nib. Visualated section. New-old-stock. A little brassing to the lever, otherwise mint. 1937 Sheaffer Sr. Lifetime Balance LF in Golden Striped. GFT. Two-toned, medium/fine nib. Visualated section. New-old-stock. Mint. 1937 Sheaffer Sr. Lifetime Balance LF in Black. GFT. Two-toned, XXXF needle-point nib. Visualated section. Near mint+. 1937 Sheaffer Sr. Lifetime Balance 1000LF in Carmine Red. GFT. Two-toned, broad nib. Visualated section. New-old-stock. Mint. 1937 Sheaffer Sr. Lifetime Balance 1000 LF in Green Striped. GFT. Two-toned, fine nib. Visualated section. New-old-stock. Mint. 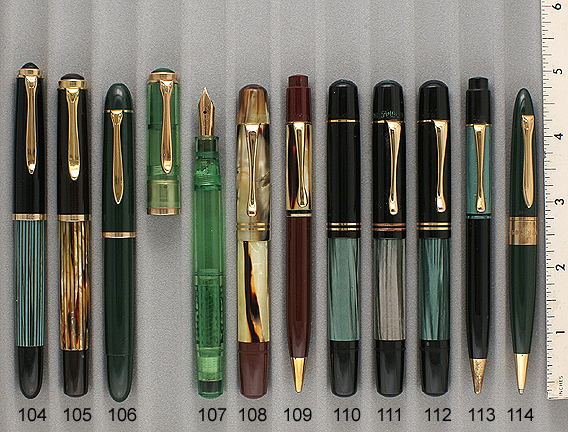 1937 Sheaffer 1000 Lifetime Balance LF Set in Green Striped. GFT. Two-toned, fine nib. Visualated section. New-old-stock. Mint. 1937 Sheaffer Lifetime Balance full-length (thin) LF in Black. GFT. Rear of cap band engraved “R.B. Munro.” Clip with engraved Masonic emblem. Two-toned medium/fine nib. Near mint+. 1941 Sheaffer 1000 Lifetime “Defender” Balance LF in Golden Striped. GFT. Over-the-top Military Clip, designed to be covered by the shirt pocket flap. Two-toned, medium nib. Visualated section. New-old-stock. Mint. 1941 Sheaffer 875 Lifetime “Vigilant” Balance LF Set in Red Striped. GFT. Over-the-top Military Clip, designed to be covered by the shirt pocket flap. Two-toned, medium nib. Visualated section. Near mint. 1941 Sheaffer Pencil for above set. 1942 Sheaffer Lifetime Balance Crest Triumph LF in Golden Striped with pinstriped gold-filled cap. GFT. Two-toned, fine nib. A few surface scratches on the cap, otherwise near mint. 1942 Sheaffer Lifetime Balance (thin) LF in Black & Pearl. GFT. While it looks like the 1936 model, it is later production with the seamed plastic (rolled & welded) cap & barrel, and the lever attached with the internal ring, rather than with a pin through the barrel. Exquisite color! Medium nib. Some imprint wear (second and third lines not readable), otherwise near mint. 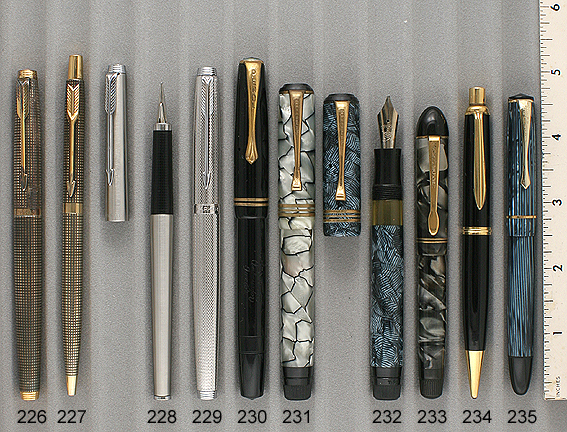 1946 Sheaffer 1500 Lifetime Triumph Balance Crest LF Set in Black with Gold-filled pinstriped caps. Fine nib. New-old-stock. Mint in original box (box a little threadbare). Close-up of set in box. 1946 Sheaffer Pencil for above set. 1929 Pelikan First Year Pelikan (often called a 100) PIF in Deep Jade Pearl. One piece Bakelite barrel, bandless cap with two vent holes and cylindrical inner cap (parallel sides). Knurled turning knob. Heart shaped vent hole in the medium/fine, flexible nib. A tad of darkening to the binde, otherwise near mint. 1929 Pelikan First Year Pelikan (often called a 100) PIF in Green Pearl. One piece Bakelite barrel, bandless cap with two vent holes and cylindrical inner cap (parallel sides). Knurled turning knob. Heart shaped vent hole in the broad, extra-flexible nib. Near mint. 1933 Pelikan 110 PIF in White Rolled Gold. Alternating Barley, plain, and pinstriped panels. Medium, flexible, italic nib (other nibs available). A little wear to the cap just below the clip (can be moved to the back of the cap, but they are actually less visible where they are). A few pin head dings to the inner cap. Otherwise near mint (if perfect, would be $2500). 1939 Pelikan 200 Repeater pencil in Cobra. GFT. Near mint. [Buy with pen above at $2800]. 1935 Pelikan 209 Repeater Pencil in Black with Red top and push button. GFT. Rare short, clipless model. Near mint. 1937 Pelikan Magnum PIF “Emege” in Tortoise with Red Cap. The only oversize Pelikan 100N model ever manufactured! Very rare. The “Emege” imprint is on the side of the cap tube (pronounced “em-gee”). “M” and “G” were the initials of the Portugal importer of Pelikan pens, who tired of fixing under warrantee pens bought elsewhere. So he had “Emege” imprinted on his pens and only covered those under warrantee. GFT. Broad, extra-flexible nib. Near mint. 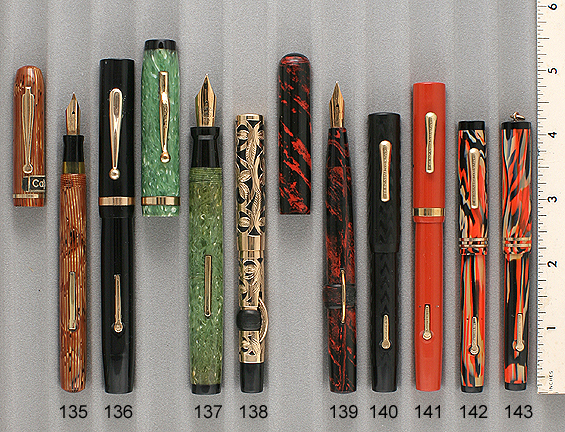 Other nibs available. 1937 Pelikan 209 Repeater Pencil in Green Pearl. Rare, short “vest pocket” model. NP nozzle. Near mint. 1937 Pelikan 100N PIF in Grey Marble (rare color). I believe this to be an example from the first year of production, as the inner cap has the old logo with four birds in the nest, which was modernized in 1938 to only two birds. GFT. Fine, extra-flexible nib (other nibs available). Near mint. 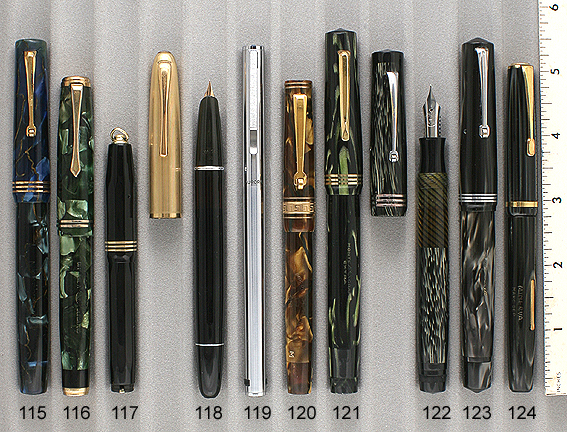 1942 100CN PIF in Black (black is a rare color for a Pelikan 100). GFT. Fine, flexible, chromium/nickle nib, used during the war when gold could no longer be used for nibs. Green celluloid barrel window. Black, synthetic piston gasket (introduced in 1942). Knurled turning knob. Medium, extra-flexible nib (other nibs available). Some wear to the inside of the barrel window, otherwise near mint. 1942 Pelikan 100 PIF in Grey Pearl (significantly rarer than Green Pearl). GFT. Green celluloid barrel window. Medium, extra-flexible nib (other nibs available). Near mint. 1947 Pelikan IBIS PIF in Black. Introduced in 1932 as an economy line. This particular pen is an early post-war example. GFT. Unusual to find with a signed “IBIS CN” nib. The barrel is marked as a fine nib, but it appears closer to medium fo me. Near mint. 1950 Pelikan 100Nf PIF Desk Set. Rare black vase-shaped base and pen with fixed taper. Pen also comes with a regular cap. Capping the pen when not using it for a few days (i.e., over the weekend) stops the pen from drying out (or for use by those folks with very deep pockets!). Green acrylic barrel. Broad, oblique nib (other nibs available). New-old-stock. Mint. Close-up of desk set. 1950 Pelikan 100N Maenner PIF in Sterling Silver “Fine Pinstriped” overlay. 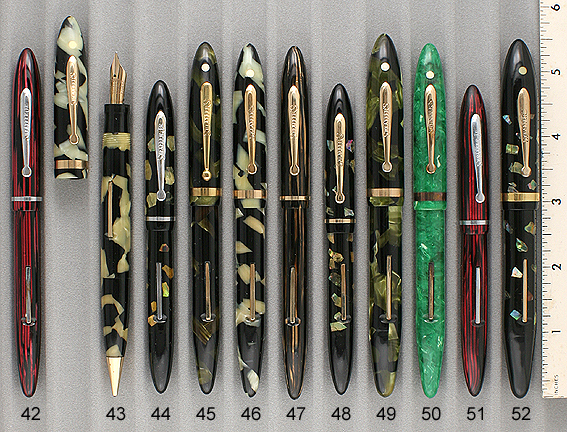 Meaner was a very famous German jeweler (equivalent to Tiffany in the USA and Asprey in the UK) which produced fine overlays for Pelikan pens. 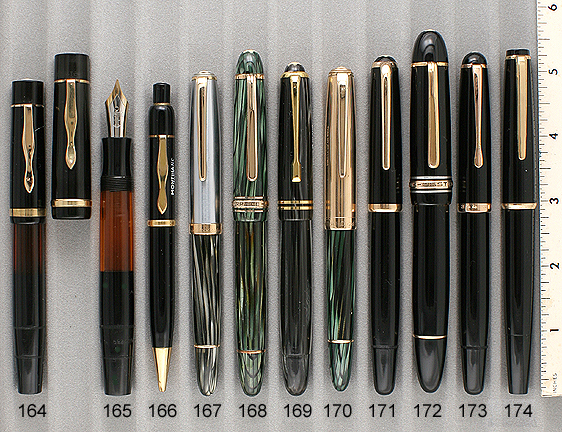 These were factory authorized models, more ornate than anything Pelikan was doing on their own. Fine, extra-flexible nib (other nibs available). While the pen underneath is near mint+, the overlay has a large number of pinpoint dings, the cap having far more than the barrel. It is still a lovely pen, a great user, and would be far, far more costly if the overlay were in near mint condition as well. 1950 Pelikan 400 PIF in Brown Striped. GFT. Medium, flexible, italic (other nibs available). Visualated barrel. Near mint. 1952 Pelikan 140 PIF in Green (rare color). GFT. Visualated barrel. Medium nib (other nibs available). Near mint. 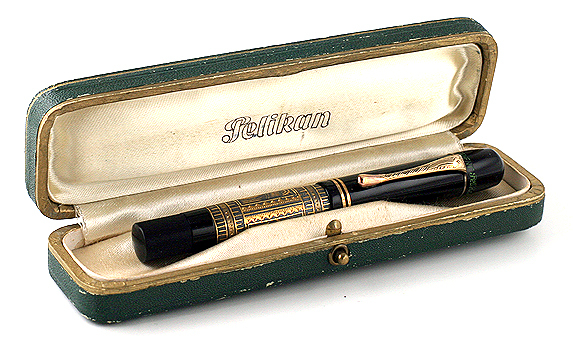 1952 Pelikan 400 Demonstrator PIF in Green Translucent. GFT. Medium, flexible nib (other nibs available). One small scratch inside the barrel window, otherwise near mint. 1953c Pelikan 101N PIF in Tortoise, with matching inner cap and Red plastic turning knob. GFT. Green acrylic barrel. Medium, flexible nib (other nibs available). Near mint+. [Buy with pencil below @ $1375]. 1950c Pelikan 201 Repeater Pencil in Tortoise. GFT. Red plastic barrel and derby. [Buy with pen above @ $1375]. 1953 Pelikan 100N “Lady” PIF in Green Pearl. Rare model, supplied with a ring instead of a clip. GFT. Green acrylic barrel. Medium/broad, oblique nib (other nibs available). Near mint. 1953 Pelikan 100N PIF in Grey Pearl. You see about one Grey Pearl binde for every couple of hundred in Green Pearl. Much rarer than most folks imagine. Extra-fine nib (other nibs available). Near mint. 1953 Pelikan 100N PIF in Green Pearl. GFT. Green acrylic barrel. Double-broad, italic nib (other nibs available – please ask for what you want). Near mint. 1937 Ancora 4 Large BF in Blue Pearl with Bronze Veins. User grade pen with an incredible fine, triple flexible, copperplate nib. Rollerball clip. GFT. This model was made in two sizes; 2 (smaller) and 4. Condition issues include some alligatoring on the cap, a small crack where the clip enters the cap, brassing and some barrel ambering. But if you would like what would have been a rare $2000 pen for only $500, you’ll have a great user! 1935 Aurora Iridia BF in Green Pearl with Black Veins. Black blind cap and G/F barrel & cap ends. GFT. Medium, extra-flexible nib. Near mint. 1942 Aurora Novum Faccettata (12-sided) lever/button-fill ring-top in black. Designed to be used with a tassie or worn on a watch chain. It fills by lifting a small lever set into the very bottom of the barrel. GFT. Fine, triple-flexible, copperplate nib! Near mint+. 1949 Aurora 88 PIF in Black with gold-filled fully pinstriped cap. User grade pen with fine, flexible nib. Visualated barrel. There is a little wear to the section imprint and a number of pinpoint dings in the cap. A great daily user, you don’t need to worry about knocking around. 2000 Aurora Hastil cartridge/converter-fill in Brushed Stainless Steel. Medium/broad nib. Converter included. New-old-stock. Mint. 1935 Imperial Pelletier 183 BF in Golden Pearl. GFT. Very attractive pen with 5 cap bands, including one wide “Greek Key” band. Very much looks Italian made, but there are no references in any of the books. There is “Imperial Pelletier” ink, with boxes marked “Belgium.” Same company – que sabe? Visualated section. Broad, flexible nib signed “Ma 14c 585 Osmi-Iridium.” Crown logo on barrel. Rollerball clip. Near mint. 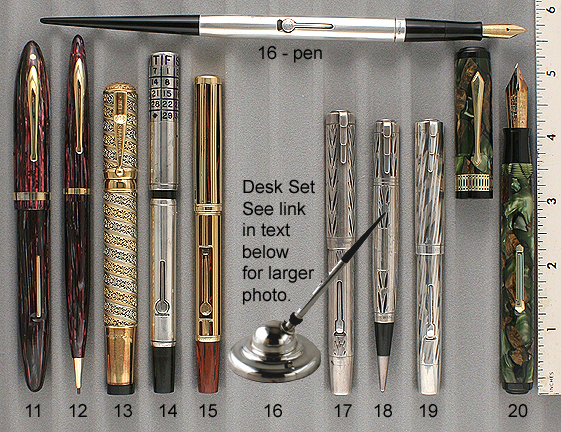 Update 10/23/10: A collector sent me a photo of the identical pen, imprinted "ASKA – Swiss Made." The research I found on Aska indicates that although they are marked "Swiss Made" they were almost certainly made in Italy (just as I had suspected about the Imperial Pellitier), perhaps by Omas, Ancora, Columbus or Tabo. It is also thought that perhaps they were made by Asca for export (the Italian alphabet doesn’t contain the letter "k"). Asca (Bologna) exported almost all their production to Germany, Austria, Hungary, Switzerland, Yugoslavia and France. If the pen was assembled from parts in Switzerland, that may have been just enough to satisfy the "Swiss Made" label. 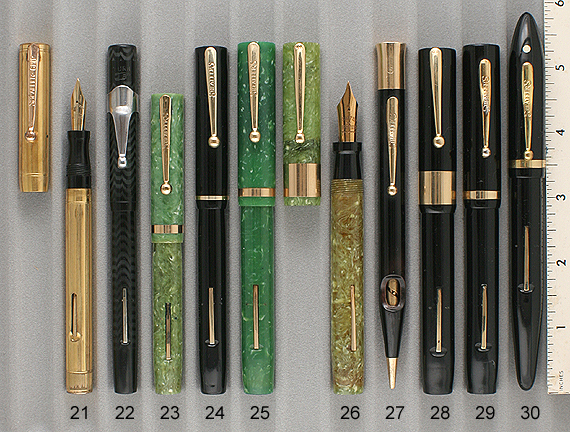 1942 Montegrappa “Extra” Large Click-fill in Green Pearl with Black Veins. The matching, knurled turning knob makes a half-turn to depress the pressure bar onto a sloping ratchet inside the knob which acts to fill the pen. This is the largest size in which this model was made. GFT. Medium nib. New-old-stock. Mint. 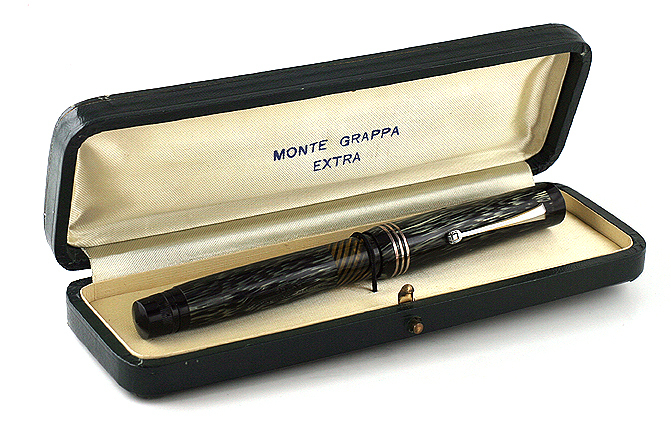 1945 Montegrappa Extra #6 size PIF in Black with Silver Veins. NPT. Long visualated barrel window with a black spiral. Rollerball clip. Medium, flexible alloy nib. New-old-stock. Mint in original box. 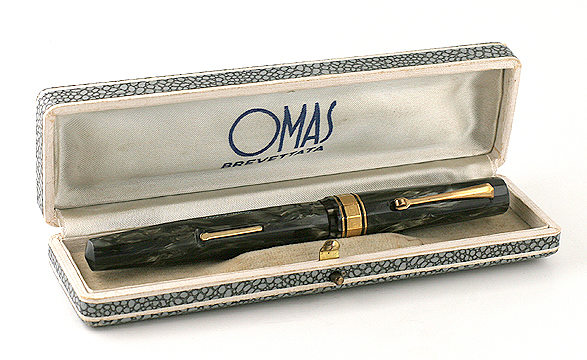 1930 Omas Extra Ogiva Large PIF in Grey Pearl Striated. NPT. Rollerball clip. NPT. Medium nib. Near mint+. Close-up of pen in box. 1934 Omas Ellittica Large lever-fill in Red Pearl. GFT. The Ellittica came in three sizes, this is the largest. GFT, with profiled hourglass shaped clip. Fine, extra-flexible nib. Near mint. 1935 Omas Extra Faceted Medium lever-fill in Platinum. Outstandingly beautiful celluloid! NPT. Broad, flexible nib. Rollerball clip. Near mint+. 1935 Omas The King Superior Large button-fill in Black & Bronze. Certainly a Duofold Sr look-a-like. GFT. Extra-fine, extra-flexible nib. Just the slightest wear to the barrel imprint, otherwise near mint. 1937 Omas Lucens Round Plunger-fill Large in Black. Visualated barrel with narrow spiral design. GFT. Wonderful fine, triple-flexible, copperplate nib! Near mint. 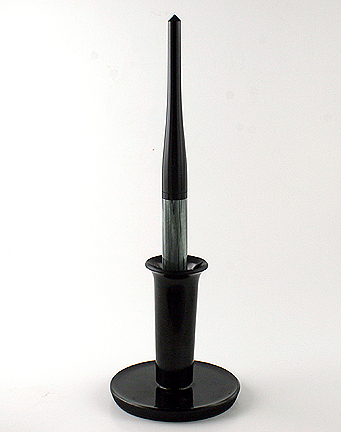 1939 Omas Extra Lucens Medium-size Faceted (12-sided) plunger-fill in Black with wide spiral visualated barrel. GFT. Fine, extra-flexible nib. Near mint. 1945 Omas 361 Faceted (12-sided) PIF in Platinum. The 361 has the hooded, double-sided nib, on which you can write on both sides ( medium, flexible & fine). GFT. New-old-stock. Mint. 1951 Omas 361 PIF in Burgundy. The 361 has the hooded, double-sided nib, on which you can write on both sides (medium, flexible & extra-fine). GFT. New-old-stock. Mint. 1960 Omas Minerva 60 PIF in Red Pearl. GFT. Extra-fine nib. New-old-stock. Mint. 2009 Omas Emilio Pucci Fantasy Ball Pen LE Edition of 3872 in White & Fuchsia. New-old-stock. Mint in box. Close-up of pen in box. 1935 Aikin Lambert “Capitole” LF in Golden Pearl Striped. GPT. Nib imprinted “18KT CAPITOLE USA.” Rare to find an Aikin Lambert with an 18K nib (no doubt made for the French market). Fine, flexible nib. New-old-stock, still with most of its original label. Some wear to the plating, otherwise near mint+. 1927 Artcraft “Lifelong” #6 size LF in Black. GFT. A Birmingham, Alabama manufacturer. Large, medium/fine, flexible nib, signed “Artcraft 50 Year Pen.” White circle inlaid into the cap top. Just a tad of imprint wear on the left side (fully readable) otherwise near mint. 1928 Carters #8 size LF in Jade with Black ends. GFT. Large, beautiful pen! Medium, italic nib. The barrel perhaps a shade darker than the cap (reflected in price), otherwise near mint. 1917 Conklin #2 Vest Pocket Crescent-fill in Gold-filled “Three Leaf Filigree” pattern overlay. Shown in Conklin’s 1917 Catalog as model #211P. Medium/fine, extra-flexible nib. Indicia engraved in Olde English script “MGD.” Near mint. 1917 Conklin S4 Crescent-fill in Red Mottled Hard Rubber. GFT. Early cone-cap (not threaded) model. Incredible condition! Fine, extra-flexible nib. New-old-stock. Mint in original Christmas box, with instructions. Close-up of pen in box. 1924 Conklin “Student Special” LF in BCHR. A rare little pen! GFT. Fine, flexible nib. New-old-stock. Mint. 1926 Conklin #2 LF in Cardinal. GFT. Fine, triple-flexible copperplate nib! Near mint. 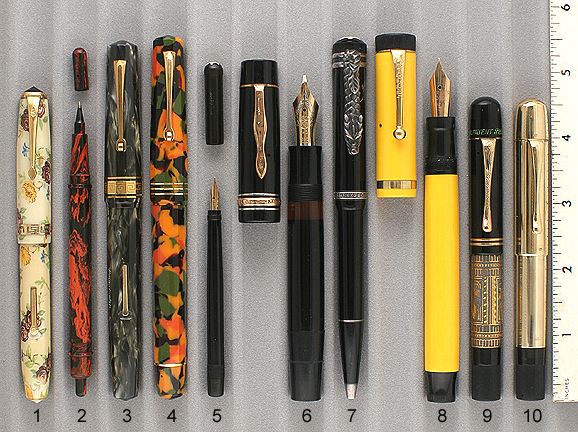 1927 Conklin #2 “Halloween” LF in Black, Orange Ivory Swirls, with Black ends. GFT. Perhaps Conklin’s most exciting celluloid. Fine, flexible, italic nib. A bit of brassing to the bottom edge of the bottom cap band, otherwise near mint. 1927 Conklin #2 “Halloween” ring-top LF in Black, Orange Ivory Swirls, with Black ends. GFT. Perhaps Conklin’s most exciting celluloid. Could be new-old-stock. Near mint+. 1925 Diamond Medal #8 “Diplomat” LF in Lapis with White & Black ends. GFT. Large #8 signed “Diamond Medal Diplomat 14K 8" medium nib. New-old-stock. Mint. 1921 Dunn “Senior” Plunger-fill in BCHR. NPT. Fine, extra-flexible, italic nib. New-old-stock. Mint with a wonderfully crisp chasing. 1983 Elysse Caprice 60 Line cartridge/converter-fill in Silver/White Metallic Lacquer. GPT. Fine nib. New-old-stock. Mint. Converter included. 1927 Hartline #2 size "Twisted Rod" Filler pen in Brown with White Specks. GFT. Extremely rare pen, with roller blotter stored under the cap derby. Featured in 2005 articles in both the Pennant and PenWorld. Signed Hartline fine nib. New-old-stock. Mint. 1927 Hartline #2 size "Twisted Rod" Filler pen in Black with White Veins and Bronze Specks. GFT. Extremely rare pen, with roller blotter stored under the cap derby. Featured in 2005 articles in both the Pennant and PenWorld. Signed Hartline fine nib. New-old-stock. Mint. 1900 Klio Fountain Pen eyedropper-fill Cone Cap in BHR. 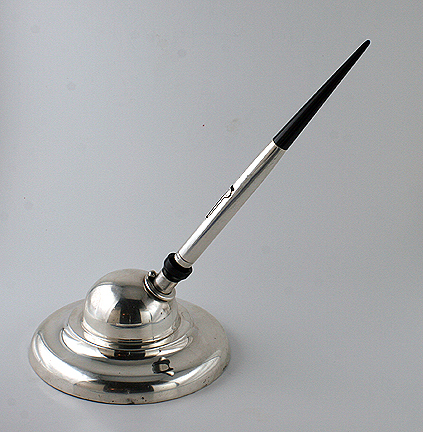 Very early pen, designed to replace the dip pen holder, based on Eduardo Reisert’s Patent (http://www.google.com/patents/about?id=hkVLAAAAEBAJ&ie=ISO-8859-1&output=html). The knurled blind cap removes to fill the pen, while a button the side is pressed to allow the ink to flow. Originally came without a nib (the user inserted his steel nib), and I have installed one to come with the pen. New-old-stock. Mint with original box (great graphics! ), eyedropper and instructions. Close-up of pen in box. 1920 Mabie Todd Swan #2 size LF in all gold-filled on BHR “Herringbone” pattern. Fine, triple-flexible copperplate nib! New-old-stock. Mint. 1932 Mabie Todd Swan 54 Eternal LF in Black. Cap with inlaid jade band. GFT. 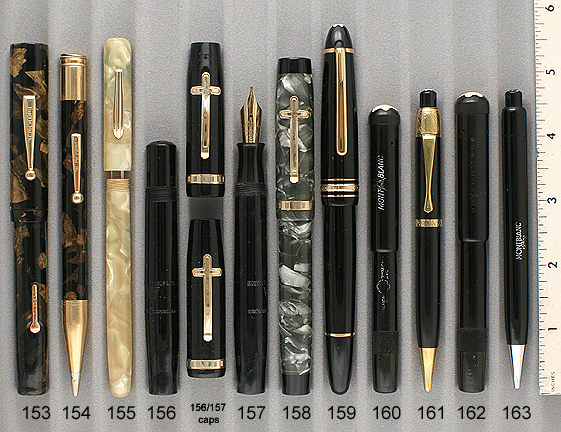 The “Eternal” was Mabie Todd’s lifetime guaranteed pen. Broad nib. Near mint. 1925 Leboeuf 90 (#8 size) LF Set in Black & Bronze. GFT. Medium, italic nib. A couple of centermeters of brassing to the front edge of the finger tab on the lever, otherwise near mint+. 1925 Leboeuf Pencil for above set. 1932 Leboeuf Thermometer Holder in Ivory Pearltex. Very rare! GFT. Complete with original “Comet” mercury thermometer. New-old-stock. Mint. 1932 Leboeuf #8 sleeve-fill in Silver Pearl with black ends. GFT. Leboeuf #8 medium, flexible nib. New-old-stock. GFT. Mint. 1988 Montblanc 146 LeGrand Traveler cartridge-fill in black. GPT. Double-broad nib. New-old-stock. Mint. List price ca. $600. 1920 Montblanc 2 Safety eyedropper-fill in Black Hard Rubber. Broad nib. A tad of imprint wear (more likely just a weak imprint stamping), otherwise new-old-stock, near mint in original box with instructions. Close-up of pen in box. 1925 Montblanc L72 Pix Repeater Pencil in BHR. GFT. This is the pencil the “Voltaire” was modeled after. Near mint. 1928 Montblanc 20 Meisterstuck Safety eyedropper-fill in BHR. Fine, extra-flexible nib. Near mint. 1930 Montblanc 92 Pix Repeater Pencil in Black. Rare, bandless & clipless model. There is no seam for the clip, just a band knurled into the barrel. NP nozzle. Near mint. 1936 Montblanc 136 PIF in Black with long visualated barrel window. GFT. Medium, flexible nib. 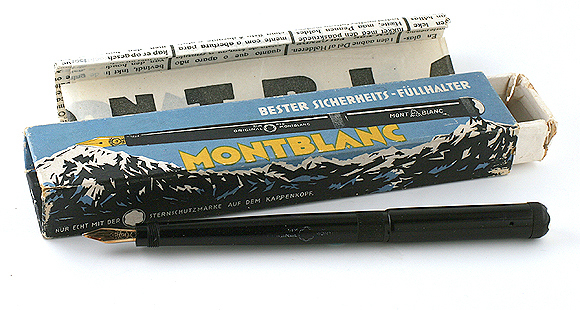 1946 Montblanc 72 Pix Repeater Pencil in Black. GFT. 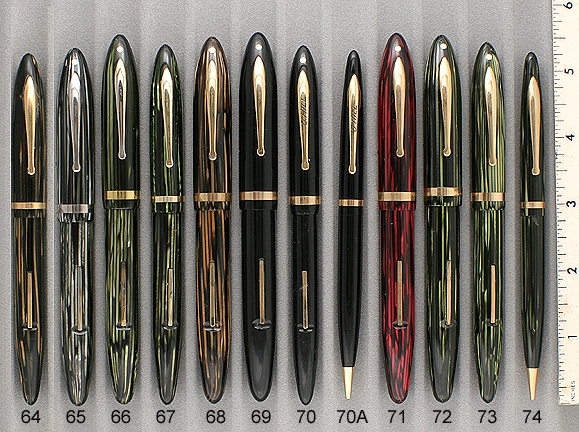 Luxury model with “hourglass” clip, made to match the early 100 series pens. Made for Italian market, as the barrel is imprinted "fabbricata in Germania" Near mint. 1950 Montblanc 642 PIF Masterpiece in Silver Striped. GFT. Brushed Chrome cap. Medium, flexible nib. Near mint. 1950 Montblanc 146G Meisterstuck PIF in Green Striped.. The largest model made in this color. GFT. Fine, flexible nib. Slightest barrel ambering, otherwise near mint. 1950 Montblanc 642 PIF Masterpiece in Green Striped. GFT. Gold-filled, pinstriped cap. Medium nib, with just a tad of flex. Near mint. 1955 Montblanc 34 PIF in Black. GFT. Fine, flexible nib. Blue tinted visualated barrel window. New-old-stock. Mint. 1955 Montblanc 14 PIF in Black. GFT. Yellow tinted visualated barrel window. Medium, flexible nib. New-old-stock. Mint. 1955 Montblanc 32 PIF in Black. Blue tinted visualated barrel window. New-old-stock. Mint. Medium/broad, flexible nib. 1955 Montblanc 22 PIF in Black. CFT. Blue tinted visualated barrel window. Broad nib. New-old-stock. Mint. 1957 Montblanc Monte Rosa 042 PIF in Black. GFT. Double-broad, flexible nib. Visualated barrel. Near mint. 1971 Montblanc 121 PIF in Black. GFT. Blue tinted visualated barrel window. Medium nib. New-old-stock. Mint. 1973 Montblanc Noblesse cartridge/converter-fill in Brushed chrome with black cap. Medium/broad nib. New-old-stock. Mint. Converter included. 1975 Montblanc Carrera PIF Desk Set. Piston-fill Carreras are very rare (99%+ are cartridge/converter-fill), as is the Carrera “Tire” desk base. 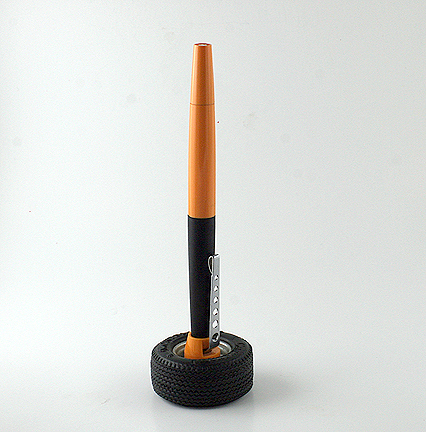 The pen cap attaches to the tire when using the pen at your desk, and when unattached it can be carried in a pocket. Visualated barrel. New-old-stock. Mint. Close-up of desk set. 1980 Montblanc 4-Color Gravity-feed Ball Point in Brushed Chrome. New-old-stock. Mint. 1985 Montblanc 149 Meisterstuck PIF in Black. GPT. 14K two-toned medium nib. New-old-stock. Mint with original label. 1985 Montblanc 149 Meisterstuck PIF in Black. GPT. 14K two-toned fine nib. Some minor wear to the platinum plating on the nib (noticeable with a loop), otherwise near mint. 1988 Montblanc 146 Meisterstuck PIF in black. GPT. 14K two-toned broad oblique nib (shaped like left foot). Near mint. 1994 Montblanc Agatha Christie Ball Pen in Black. Sterling Silver trim. Serial number 11519/25000. No box or papers. New-old-stock. Mint. 1999 Montblanc Proust Pencil in Sterling Silver. Serial number 2379/4000. No box or papers – comes from a split up 3-piece set. New-old-stock. Mint. 1999 Montblanc Proust Ball Pen in Sterling Silver. Serial number 12713/20000. New-old-stock. Mint in original box with all papers. Close-up of pen in box. 1950 Osmia 223 BF in Brown. GFT. The nib size is marked “F” on the barrel, but to me it writes more like a medium. New-old-stock. Mint. 1950 Osmia 223 BF Set in Green. GFT. The nib size is marked “EF” on the barrel, but to me it writes more like a medium. New-old-stock. Mint. 1950 Osmia Pencil for above set. 1950 Osmia 882 PIF in Green Pearl with Black Vertical Stripe. GFT. Broad, oblique (left foot) nib. Visualated barrel. Near mint. 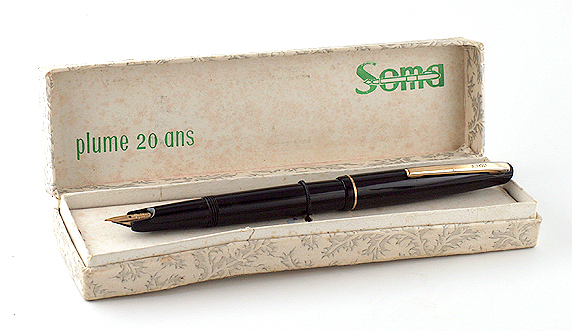 1955 Osmia 884 Faber-Castell PIF in Green Pearl with Black Stripes. GFT. In 1935, Osmia became a division of Faber-Castell. 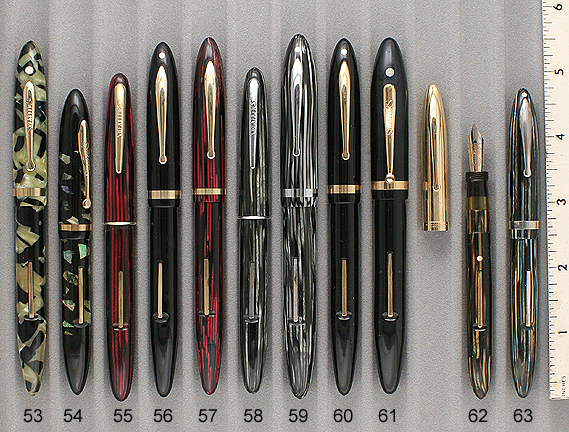 The 884 was the largest pen in this series. Two-tone, fine, extra-flexible nib. The cap top sports the Osmia logo (used until the early 1960s. Translucent barrel. Near mint. 1916 Parker #33 Jack Knife Safety eyedropper-fill in BHR with Gold-filled filigree derby and barrel overlay. Quite rare! #3 “Lucky Curve” medium, flexible nib. A little wear to the imprint (fully readable), otherwise near mint with no dents, dings, or wear to the metal. 1926 Parker Duofold Sr. “Big Red” BF in Cardinal. GFT. Double-broad nib (very rare). New-old-stock. Mint in original box. Close-up of pen in box. 1927 Parker Duofold Sr. BF in Lapis. Incredibly beautiful color! GFT. Extra-fine nib. New-old-stock. Mint. 1929 Parker Duofold Sr. BF in Jade. GFT. Outstanding mint color! New-old-stock. Does not have a sac – will install one (silicon or latex) on request. Medium nib. 1930 Parker Duofold Juniorette BF in Jade. Almost impossible to find with absolutely mint color! GFT. Fine nib. New-old-stock. Mint. No bladder, but I will install one on request. 1930 Parker Duofold Juniorette BF in Lapis (white on blue). GFT. Outstanding mint color! New-old-stock. Does not have a sac – will install one (silicon or latex) on request. Fine nib. 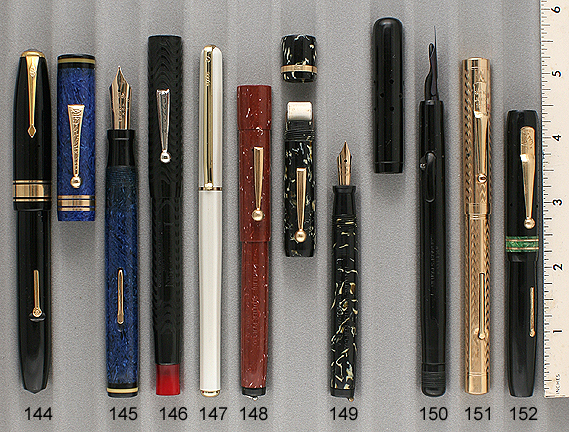 1930 Parker Duofold Jr. BF in Lapis (white on blue). GFT. Outstanding mint color! New-old-stock. Does not have a sac – will install one (silicon or latex) on request. Medium nib. 1932 Parker Duofold VP (Vest Pocket) BF Set in Black & Pearl. Almost impossible to find without ambering. This pen has mint color! The pencil, of all things, has a bit of ambering! No barrel imprint (not worn off – never had one). Medium nib, with just a tad of flex. Near mint. 1936 Parker Vacumatic Jr. In Green Marble. GFT. Short lived model (1934 – 1937). Wonderful example with a highly transparent barrel! New-old-stock. Mint. 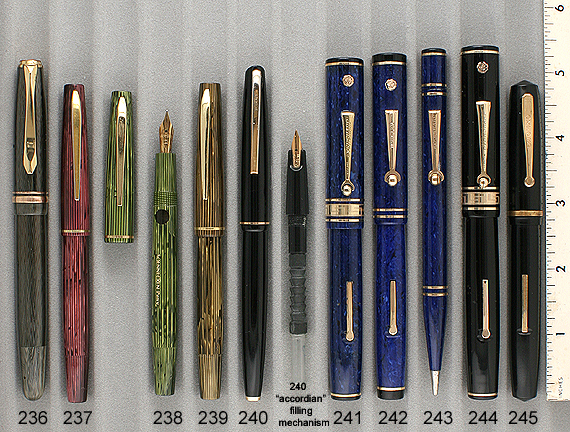 1941 Parker Duofold Deluxe Vacumatic-fill Set in Blue, Silver & Black Striped. GFT. Medium/fine nib. Near mint. 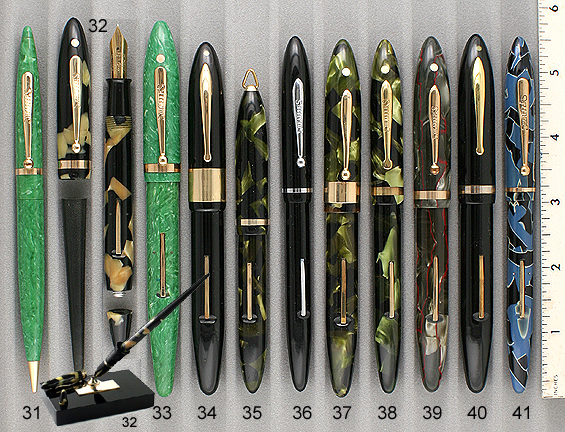 1945 Parker Vacumatic Standard in Black Laminated. GFT. Visualated barrel with far above average barrel translucency!. Extra-fine nib. Near mint. 1945 Parker Vacumatic Jr. In Black Laminated. GFT. Medium nib. Near mint. 1947 Parker 51 Vacumatic-fill in Cordovan Brown. Cap is 1/10 12K gold-filled with the “5-converging line” pattern. This is the correct 1947 cap with long, non-blue diamond clip. Medium/fine nib. Near mint. 1948 Parker 51 Vacumatic-fill in Dove Grey. Pinstriped Sterling Silver Cap. Fine point. I wish I could tell you that the cap is perfect, but it does have just a minor bit of wear, otherwise the pen is near mint. 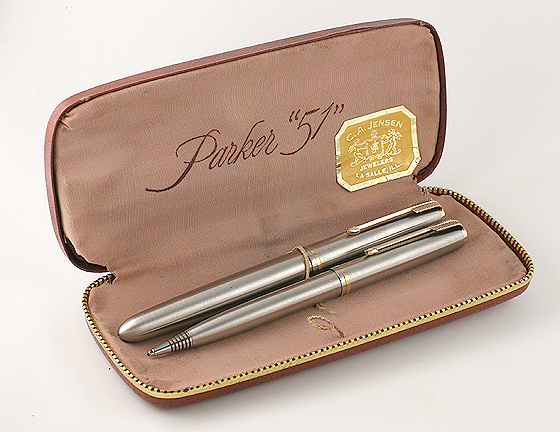 1950 Parker 51 “Flighter” Aerometric-fill Set in Brushed Lustraloy (stainless steel). GFT. Fine nib. New-old-stock. Mint in original box. Close-up of set in box. 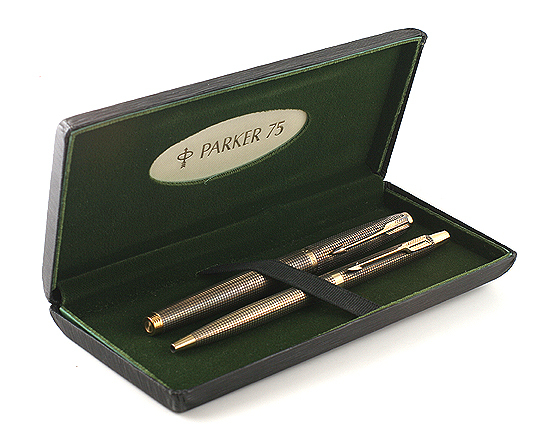 1951 Parker 51 Aerometric-fill Set in Forest Green with Lustraloy (stainless steel) caps. Forest green is one of the harder colors to find. Medium/broad nib. The set is used and the caps have surface scratches noticeable with magnification. No dents or dings or scratches to the plastic. 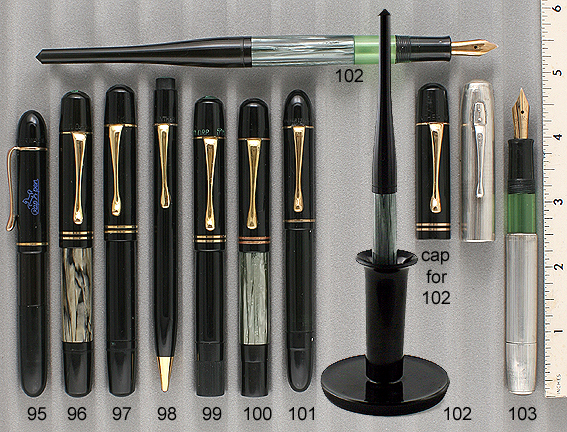 1952 Parker 51 Aerometric-fill in black with brushed Lustraloy (stainless steel) cap. Medium/broad nib. Near mint. 1957 Parker 61 “Heirloom” capillary-fill in Red. Two-toned Pink and Yellow G/F “Rainbow” cap. Medium nib. Has been filled, otherwise near mint. 1957 Parker 61 Presidential capillary-fill in 14K solid gold “Smooth” pattern. Extra-smooth, medium/broad nib. Has been filled, otherwise mint. 1960 Parker 45 Signet cartridge/converter-fill in gold-filled pinstriped. 14K medium nib. New-old-stock, but there are some surface scratches (noticeable with a loop) from being around for 50 years. Converter included. 1964 Parker “17 Super” Aerometric-fill in Blue. Hard to find model. GFT. UK manufacture. Broad nib. Has been filled. Near mint. 1970 Parker T-1 Ball Pen in Titanium. 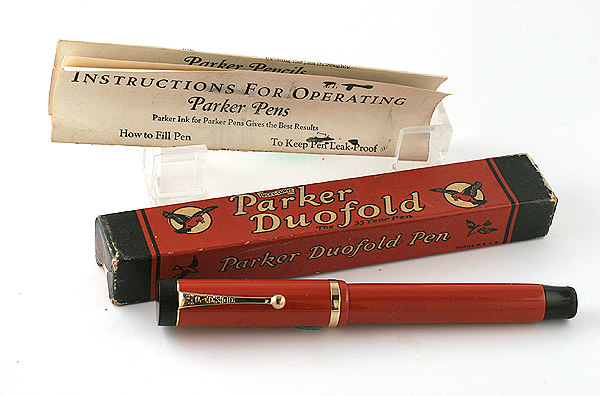 Originally for fiber-tip refills, Parker produced a conversion kit so these can be used for standard ball pen refills. New-old-stock. Mint. 1974 Parker 75 Cisele cartridge/converter-fill in Sterling Silver “Crosshatch” pattern. Fine nib (other nibs available). Near mint. 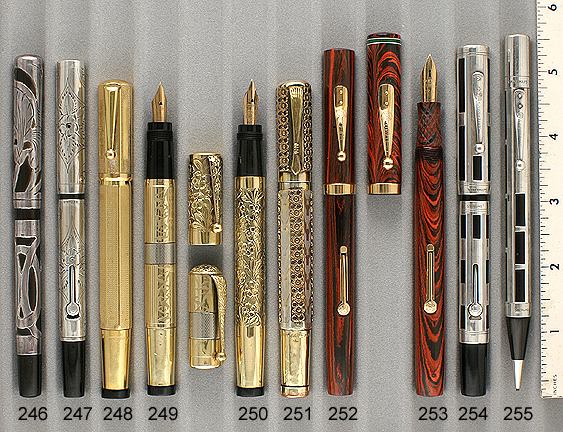 1974 Parker 75 Prototype Demonstrator Cartridge/converter-fill in Gold-filled “Insignia” pattern. Pen has a transparent gripping section! These are not known to have been sold nor distributed to dealers as demonstrators. Still has the parker Model Shop number strip on the barrel. Fine nib. New-old-stock. Mint. 1975 Parker 75 Cisele Cartridge/converter-fill Set in Vermeil (14K GF on sterling silver). Fine nib (other nibs available). New-old-stock. Mint in original box. Close-up of set in box. 1975 Parker Pencil for above set. 1979 Parker 180 Flighter cartridge/converter-fill in Stainless Steel. 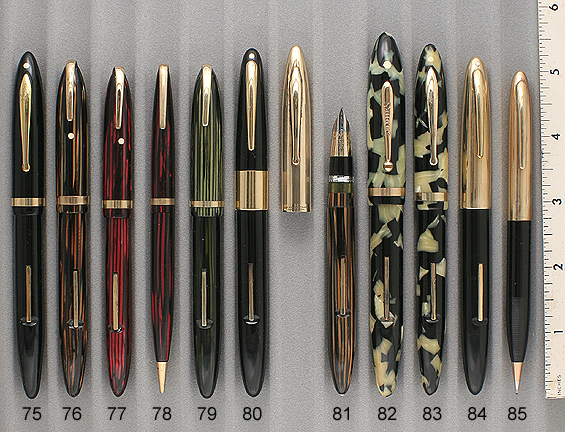 The famous Parker model with the triangular-shaped, double-sided nib, each of which writes in a different line width. New-old-stock. Mint. 1989 Parker 75 “Grain D’orge” cartridge/converter-fill in Chrome Electroplate full “Barley” pattern. Extra-fine/fine nib (other nibs available). New-old-stock. Mint. Converter included. 1942 Penol “Ambassador Jr.” PIF in Black. GFT. Made by the Christopher Olson Pen Company in Denmark, which manufactured pens for many major pen companies, such as Parker and Montblanc. Visualated barrel. Medium, flexible nib. Near mint. 1946 Soennecken 110 PIF in Silver Pearl Marble. GFT. Visualated barrel. Medium, flexible, italic nib. Near mint. 1950 Soennecken 22 Repeater Pencil in Black. GFT. New-old-stock. Mint. 1952 Soennecken 104 PIF in Blue Pearl with Black Pinstriping and black ends. GFT. Visualated barrel. Fine, flexible, italic nib. New-old-stock. Mint. 1930 Soma #2 size BF in Black. GFT. Rare model, fitted with an “accordion” sac (shown disassembled and assembled). Push the plunger several times to fill the pen, like a Parker Vacumatic, except this plunger rod is hollow and lets you see the remaining ink supply. French manufacture. Extra-fine nib. New-old-stock. Mint in original box. Close-up of pen in box. 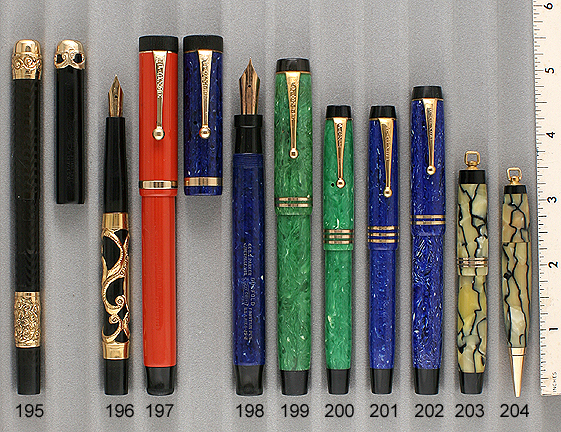 1927 Wahl Eversharp Oversize Deco Band Personal Point LF in Lapis. 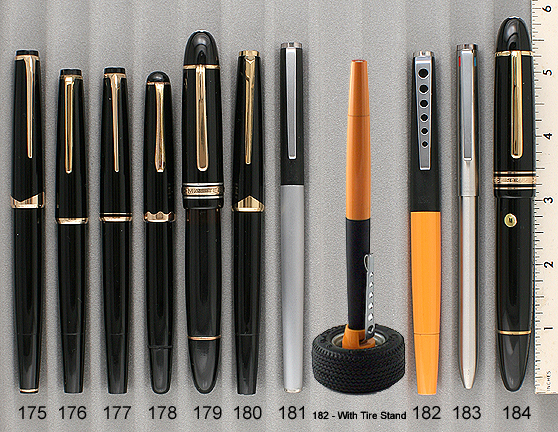 Wahl’s Personal Point pens have screw-out interchangeable nibs and were Wahl’s answer to Waterman’s color-coded nibs. GFT. Medium “Gold Seal Signature” nib. Barrel threads show wear (reflected in price), but they operate perfectly, otherwise near mint. 1927 W’ahl Eversharp Gold Seal Rollerball Personal Point LF Set in Lapis. GFT. Fine, extra-flexible, “Wahl Eversharp 14K Gold Seal Flexible” nib. New-old-stock. Mint. 1927 Wahl Eversharp Oversize Deco Band Personal Point LF in Black. GFT. A strikingly handsome pen! Medium/fine “Gold Seal Signature” nib. Near mint+. 1935 Wahl Eversharp Oxford Equipoised LF in Black. GPT. Odd barrel imprint runs around the barrel rather than parallel to the barrel! Nib signed “Selecto Point C Iridium Tip Firm Med Made in USA.” Minor cap plating wear, otherwise near mint. 1903 Waterman (4)14 eyedropper-fill Cone Cap in Heavy Fine Silver 3-Leaf Art Nouveau Overlay pattern on BHR. Indicia engraved " L.LA.Count." Extra-fine, extra-flexible nib. Near mint. 1915 Waterman (4)52 ½ LF in Sterling Silver “Oriental” pattern (one of the much rarer overlays). Medium, flexible nib. A few pinpoint dings here and there, otherwise near mint. 1917 Waterman 42 “Continental Safety” eyedropper-fill in 18 K gold-filled on BHR. Alternating panels of (A) pinstripe & (B) geometric designs formed within very fine pinstriping. The middle ½" of both the cap and barrel have a 3/8" band of contrasting White Rolled Gold Barley. Matching cap. Repousse floral design on both the crown and clip. Cork unrestored. Near mint. 1917 Waterman 42 “Continental Safety” Octagonal eyedropper-fill in 18 K gold-filled on BHR. Barrel is entirely in “Barley” design. Each side of the “Barley” cap has a long, thin smooth rectangle. Smooth clip and cap top. Fine, flexible nib. A few pinpoint dings, otherwise near mint in original box. Close-up of pen in box. 1917 Waterman 42 Safety “Continental Overlay” eyedropper-fill in 18K rolled-gold (gold-filled). High relief Floral and Vine Repousse on hand hammered background (very unusual). Matching cap with plain crown and matching clip. Extra-fine, extra-flexible nib. A few scratches right at the bottom border, otherwise near mint. 1917 Waterman 42 Safety “Continental Overlay” Octagonal eyedropper-fill in 18K rolled-gold (gold-filled). Alternating pattern; “Y” shaped geometric design formed by engine-turned pinstripe, and high repousse “Floral Filigree” applique. Quite beautiful. Plain crown and fluted hourglass shaped clip. Broad nib. A few minor dents in the smooth surface just above the turning knob, otherwise near mint. Cork seal in end of pen unrestored. 1925 Waterman 52 LF in Woodgrain HR. GFT. Medium, flexible nib. New-old-stock. Mint. 1928 Waterman 454 LF Set in Sterling Silver “Night & Day” pattern (one of the rarer overlays). Medium, italic nib. Indicia engraved in script “M.P.H.” Near mint. 1928 Waterman Pencil for above set. 1933 Waterman “Thorobred” LF in Silver Pearl with Red Veins. GFT. Extra-smooth, fine nib. Visualated section. A tad of clip ball brassing, otherwise near mint. 1936 Waterman Lady Patricia Ink-Vue Vacuum-fill in Grey Lace. Pumping the lever operates the diaphragm which fills the pen. NPT. Medium/fine, italic nib. Highly visualated barrel. A little trim wear here and there, otherwise near mint. 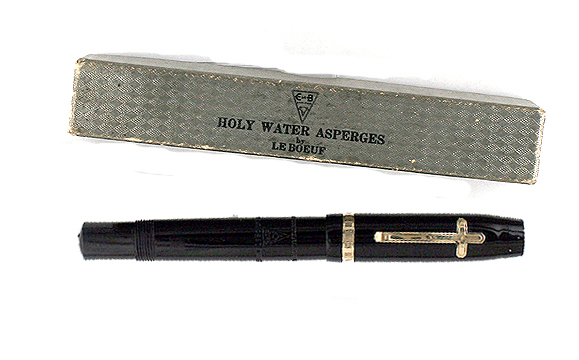 1943 Waterman Emblem LF in Black. Fully ribbed model. Basically a 100 Year Pen marketed without the 100 year guarantee. Canadian manufacture. GFT. Fine, italic nib. Near mint. 1949 Waterman Crusader LF in Brown. GFT. Gold anodized aluminum cap with 5 bands. This is not the Taperite model, and has the full, open nib. Fine, extra-flexible, italic nib. New-old-stock. Mint with original label. 1989 Waterman Man Bicentennial Revolution Ball Pen in Black. GPT. Manufactured in honor of the 200th anniversary of the French revolution. Clip engraved with three flying birds and “1789 1989." New-old-stock. Mint, in original box, with wooden outer box, instructions, guarantee and Certificate of Authenticity. Close-up of pen in box. 1994 Waterman Expert Ball Pen in Black. GPT. New-old-stock. Mint. 1995 Waterman Patrician cartridge/converter-fill in Coral Lacquer. GPT. Two-toned, 18K, double-broad nib. New-old-stock. Mint. Converter included. 1995 Waterman Le Man 200 Rhapsody cartridge/converter-fill in Mineral Green. GPT. Two-toned, 18K, Medium/fine nib. New-old-stock. Mint. Converter included. 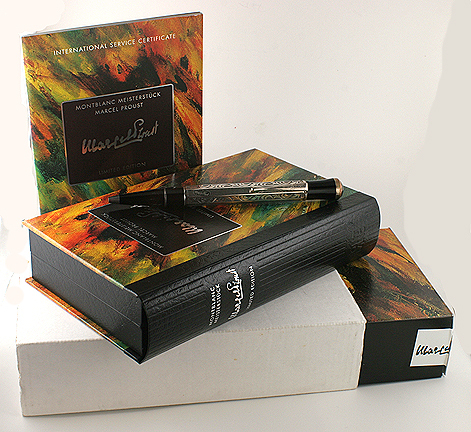 1995 Waterman Maestro cartridge/converter-fill in Black Matte. GPT. GP medium/fine nib. New-old-stock. Mint. Converter included.